Isn’t it time you became Microbe Wise? At Hi-Tech Ag, when considering where production improvements could be gained, we encourage growers to understand and test the biological status of their soil. 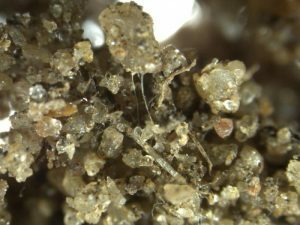 Soil is a dynamic habitat for an enormous variety of life-forms, and provides a mechanical support to plants from which they extract nutrients. 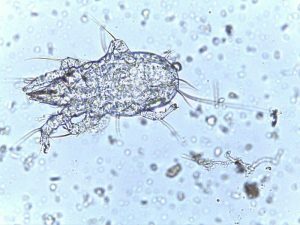 A healthy soil is colonised by a staggering variety of micro and macro organisms. Within the physical surrounding of a soil, it’s life interacts with one another in a biological balance that allows for buffering of changing conditions. This balanced activity of living organisms helps to maintain and improve soil quality, depth, structure and properties. These complex communities contribute significantly to the cycling of nutrients, plant health and water quality. However these underground workforces are often disregarded in their importance to agricultural production. Contact us and book in your Microbiology Assessment today! 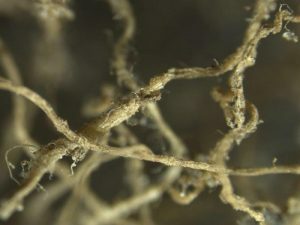 Beneficial fungal strands protruding from the root can be seen holding soil aggregates, creating soil structure. 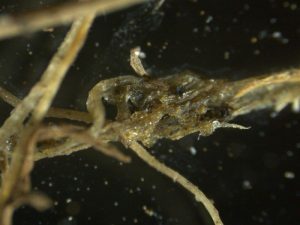 Plant roots with no beneficial fungi association. The roots are bare and ligneous, and soil structure is not present. 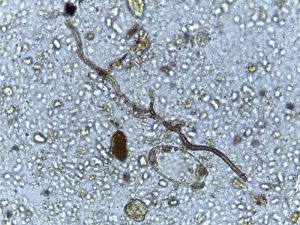 For a more advanced and measured analysis of your soils biological status, we utilise services through Microbe Wise. This test measures the living biomass of key microbial groups interacting and impacting on the cycles within soil. State of the art molecular technology allows for measuring of microbe groups responsible for nutrient release, disease suppression, carbon sequestration, and general important soil processes. Although the testing is advanced, the reporting (seen below) is designed for practical use by advisors and growers for easy interpretation and recommendation. Sampling for biological examination can be quite particular, and require certain storage and transportation methods such as refrigeration to remain viable by the time they reach their destination. To organise a microbiology test, contact the office to be put in touch with your local Hi Tech Agronomist for assistance.